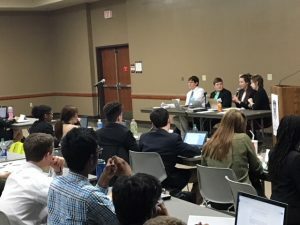 The UCA Department of Political Science hosted the 53rd Arkansas Model United Nations (AMUN) conference at the University of Central Arkansas on November 16-17, 2018. Some 560 delegates from 30 high schools in Arkansas, Tennessee, and Texas participated in the conference. Spencer Burton served as Secretary-General, and Willis Arnold served as Deputy Secretary-General of the conference. 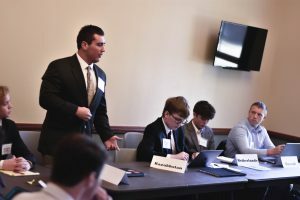 Dr. Mark Elrod, Lecturer in the Department of Political Science, served as AMUN Conference Coordinator. Dr. Mark Mullenbach, Associate Professor of Political Science, served as AMUN Faculty Advisor Liaison. During the opening session held in Ida Waldran Auditorium in Main Hall on Friday, November 16th, Dr. Tom Williams, Dean of the College of Liberal Arts, gave the welcoming address to the assembled delegates. 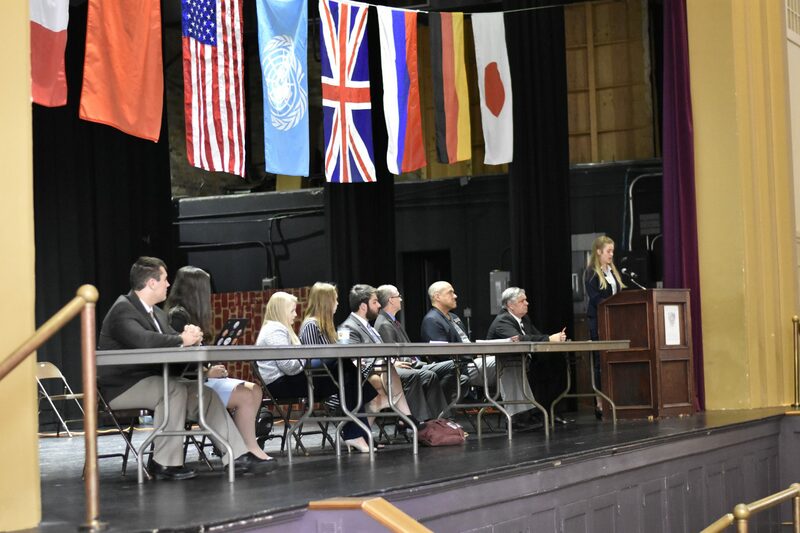 In addition, four students spoke to the assembled delegates, including Drew Janes (United Kingdom) of Pope John Paul II High School, Landon Perdue (Equatorial Guinea) of Brookland High School, Genrietta Churbanova (Russian Federation) of Pulaski Academy, Seylor Cluck (France) of Haas Hall Academy-Fayetteville, and Madi Bagsby (Morocco) of Pope John Paul II High School. The delegation representing France (Haas Hall Academy-Fayetteville) was presented the Outstanding Delegation award during the closing session on Saturday, November 17th. 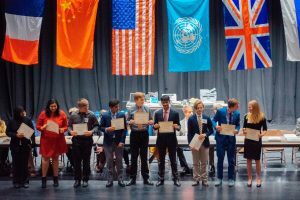 The delegations representing the Russian Federation (Pulaski Academy) and the United Kingdom (Pope John Paul II High School) were presented the Outstanding Delegation Runner-Up awards during the closing session. 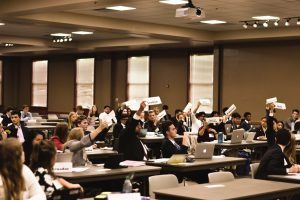 The UCA Department of Political Science sponsored the 52nd Arkansas Model United Nations (AMUN) conference at the University of Central Arkansas on November 17-18, 2017. More than 500 delegates from 25 high schools in Arkansas, Missouri, and Tennessee participated in the conference. Carolyn Casey served as Secretary-General, and Alex Battaglia served as Deputy Secretary-General of the conference. 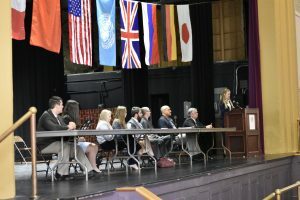 Dr. Mark Mullenbach, Associate Professor of Political Science, served as AMUN Coordinator, and Stephanie Gray served as Assistant AMUN Coordinator. Dr. Marl Elrod, Instructor in the Department of Political Science, served as Coordinator of the Model International Court of Justice (MICJ), and Kayla Close served as Deputy Secretary-General and Coordinator of the Novice General Assembly Committees. During the opening session held in Ida Waldran Auditorium in Main Hall on Friday, November 17th, three students addressed the assembled delegates, including Mohammed Abuelem (France) of Pulaski Academy, Ana Estrada (Brazil) of Haas Hall Academy-Fayetteville, and Anushka Yadava (Egypt) of Little Rock Central High School. The delegation representing France (Pulaski Academy) was presented the Outstanding Delegation award during the closing session on Saturday, November 19th. The delegations representing Brazil (Haas Hall Academy-Fayetteville) and Sweden (Haas Hall Academy-Fayetteville) were presented the Outstanding Delegation Runner-Up awards during the closing session. 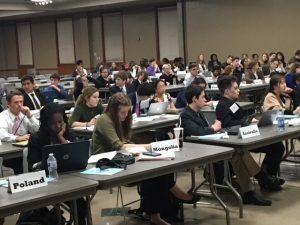 The UCA Department of Political Science sponsored the 51st Arkansas Model United Nations (AMUN) conference at the University of Central Arkansas on November 18-19, 2016. Nearly 600 delegates from 27 high schools in Arkansas, Oklahoma, and Tennessee participated in the conference. 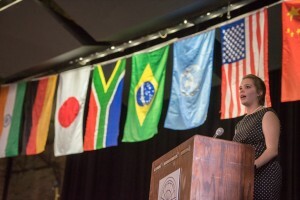 Alex Battaglia, a senior majoring in International Studies at UCA, served as Secretary-General. Dr. Mark Mullenbach, Associate Professor of Political Science, served as Coordinator of the AMUN Conference. 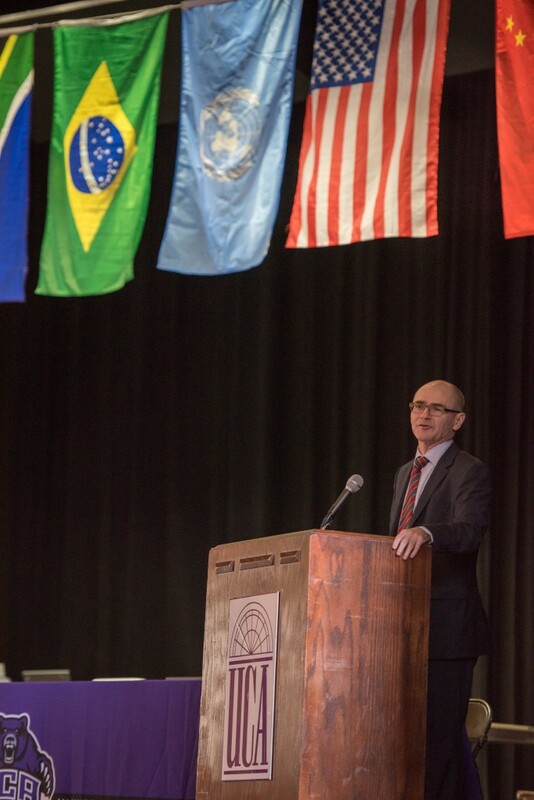 Robert Andrew, U.S. Department of State Diplomat-in-Residence at the University of Oklahoma, gave the keynote address during the opening session on Friday, November 18th. The delegation representing the United Kingdom (Pope John Paul II High School in Hendersonville, TN) was presented the Outstanding Delegation award during the closing session on Saturday, November 19th. Alex Battaglia, Secretary-General of the 51st AMUN, presided over the closing session on Saturday, November 19th. 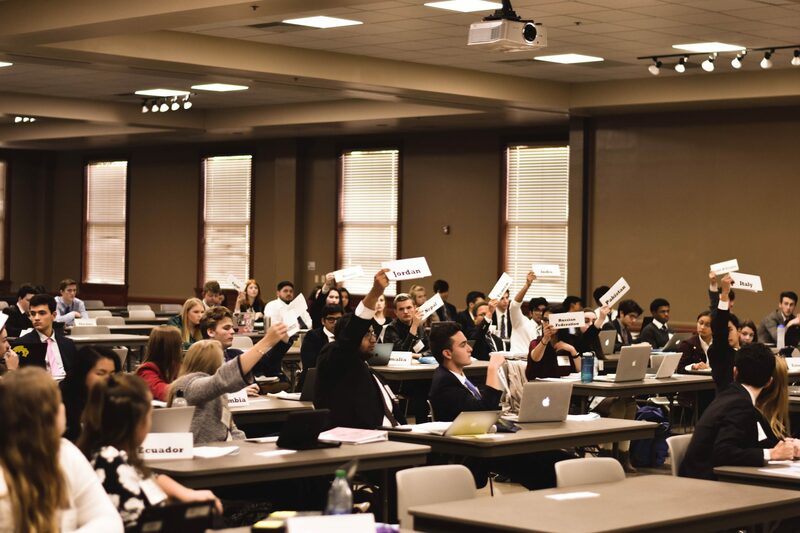 The UCA Department of Political Science sponsored the 50th Arkansas Model United Nations (AMUN) conference at the University of Central Arkansas on November 20-21, 2015. 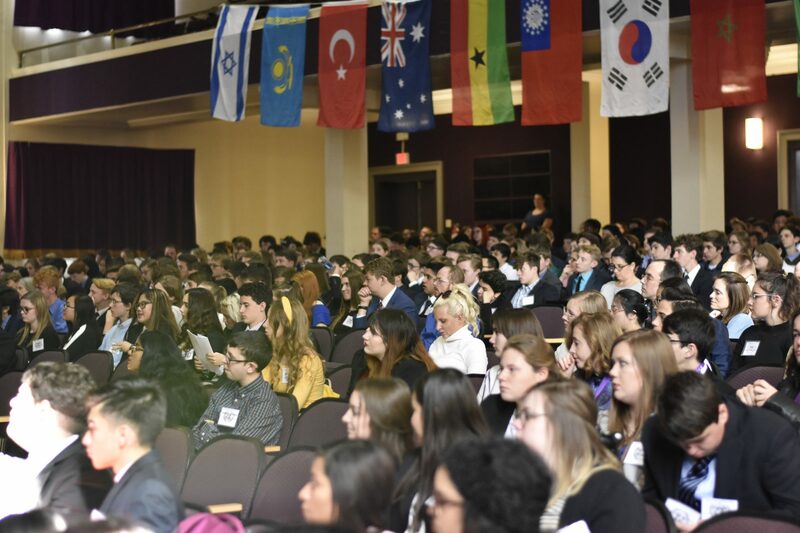 More than 560 delegates representing 122 countries from 29 high schools in Arkansas, Tennessee, Mississippi, and Oklahoma participated in the conference. 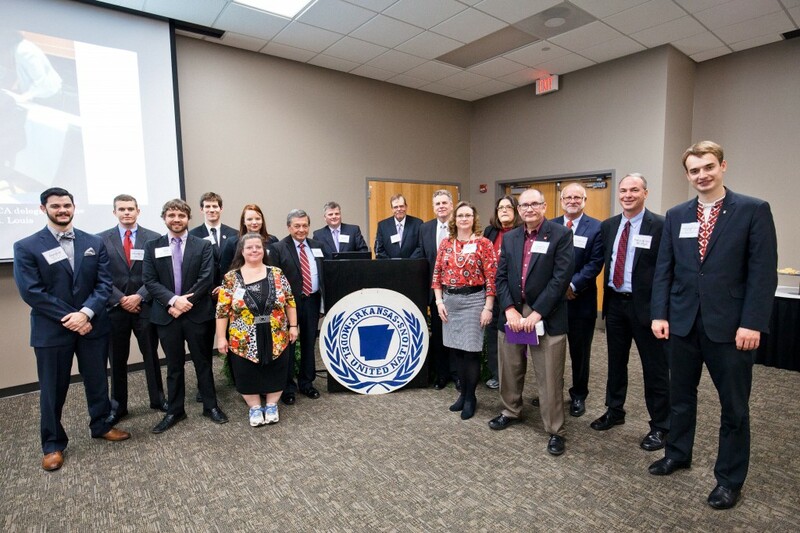 Breanna Wilbanks from Russellville, Sociology (major) and Anthropology (minor) at UCA, served as AMUN Secretary-General (pictured below, bottom-left) and Dr. Mark Mullenbach, Associate Professor of Political Science, served as Coordinator of the AMUN conference. UCA President Tom Courtway gave the welcoming address to the delegates during the Opening Session in Ida Waldran Auditorium on Friday, November 20th. Mr. Bernd G. Reindl, Deputy Consul General at the Consulate General of the Federal Republic of Germany in Houston, gave the keynote address during the Opening Session (pictured below, bottom-right). Committee chairs included Jesus Torres (Special Political Committee), Kayla Close (Social & Humanitarian Committee), Willis Arnold (Economic & Finance Committee), Alex Battaglia (Security Council), Stephanie Gray (Historical Security Council), Katelyn Wilkins (Economic & Social Council), Ashley Semiche (Model Arab League), and Nick Cartwright (Human Rights Council). Dr. Mark Elrod, Visiting Assistant Professor in the UCA Department of Political Science, served as Coordinator of the Model International Court of Justice (MICJ). During the Closing Session on November 21st, the “Outstanding Delegation” award was presented to the Nigerian delegation (Pulaski Academy, Little Rock) and the “Outstanding Delegation Runner-Up” awards were presented to the French delegation (Conway High School, Conway) and United Kingdom delegation (Haas Hall Academy, Fayetteville). 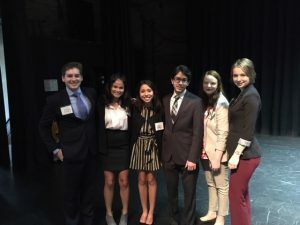 Several students were also awarded “Outstanding Delegate” awards for performance in each of the nine committees. On Friday evening, a 50th AMUN Anniversary reception and dinner were held in Brewer-Hegeman Conference Center. Sixteen former AMUN secretaries-general (pictured below, top-left) and several other invited guests participated in the event, including Mr. David Gruber (AMUN secretary-general in 1967) and Mr. Brett Newcomb (AMUN secretary-general in 1968). Mr. Robert B. Andrew, U.S. Department of State Diplomat-in-Residence at the University of Oklahoma, was the guest speaker during the dinner. The UCA Department of Political Science sponsored the 49th Arkansas Model United Nations (AMUN) conference at the University of Central Arkansas on November 21-22, 2014. 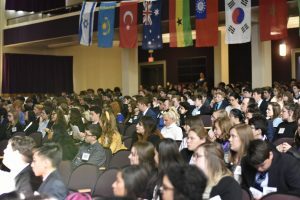 Some 425 delegates representing 90 countries from 24 high schools in Arkansas, Tennessee, Mississippi, and Oklahoma participated in the conference. 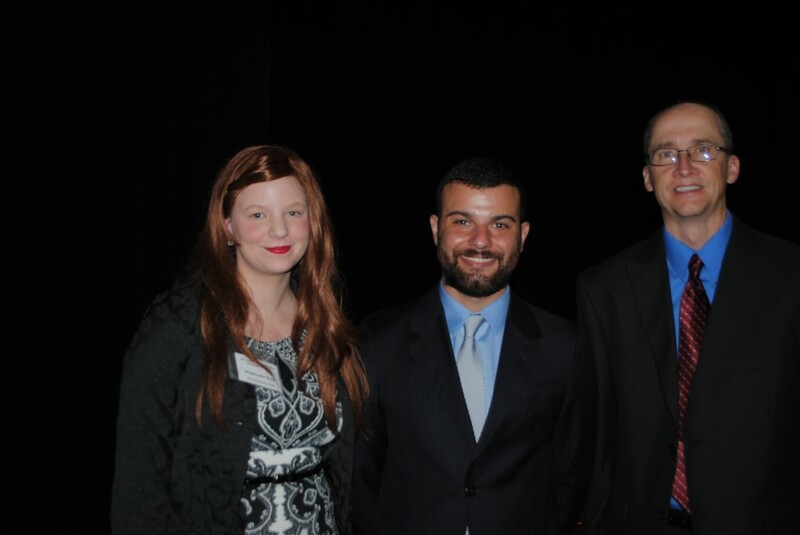 Stephanie Gray (pictured below on the left), International Studies major in the UCA Department of Political Science, served as AMUN Secretary-General and Dr. Mark Mullenbach (pictured below on the right), Associate Professor of Political Science, served as Coordinator of the AMUN conference. UCA President Tom Courtway gave the welcoming address to the delegates during the Opening Session in Ida Waldran Auditorium on Friday, November 21st. 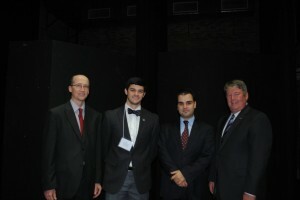 Jose Guzzardi (pictured below in the middle) gave the keynote address during the Opening Session. 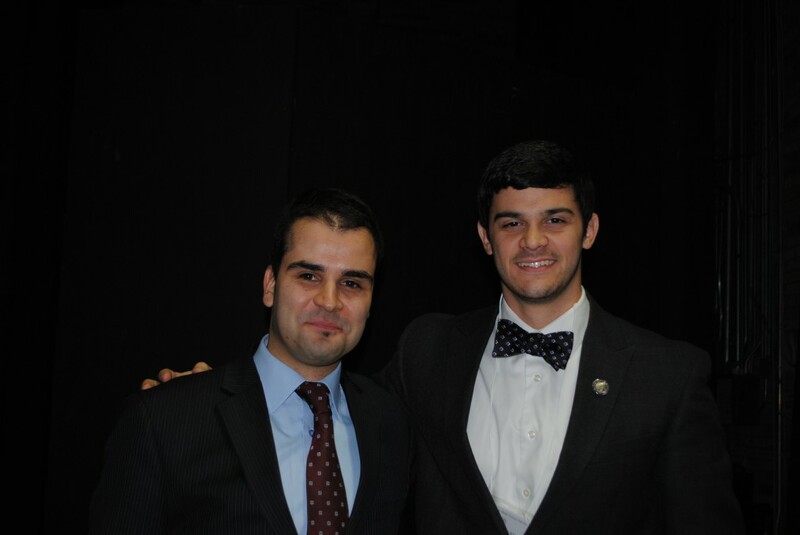 Jose Guzzardi, who served as AMUN Secretary-General for the 41st AMUN conference held in 2006, graduated with a B.A. degree in International Studies from UCA in 2007. He is currently employed as a Sourcing Manager for Wal-Mart (E-Commerce) in Sao Paulo, Brazil. Jose Guzzardi earned a Master’s degree from the Clinton School of Public Service in Little Rock in 2009, and he was previously employed as the Manager of Institutional Relations for Wal-Mart in Brazil from January 2011 to August 2014. Committee chairs included Juan Mayen (Special Political Committee), Kayla Close (Social & Humanitarian Committee), Jordan Kemp (Economic & Finance Committee), Kate Loyd (Security Council), Breanna Wilbanks (Economic & Social Council), Nora Bouzihay (Model Arab League), and Helena Burrow (Human Rights Council). Dr. Mark Elrod, Visiting Assistant Professor in the UCA Department of Political Science, served as Coordinator of the Model International Court of Justice (MICJ). During the Closing Session on November 22nd, the “Outstanding Delegation” award was presented to the German delegation (Pope John Paul II High School, Hendersonville, TN), and the “Outstanding Delegation Runner-Up” award was presented to the Syrian delegation (Conway High School). 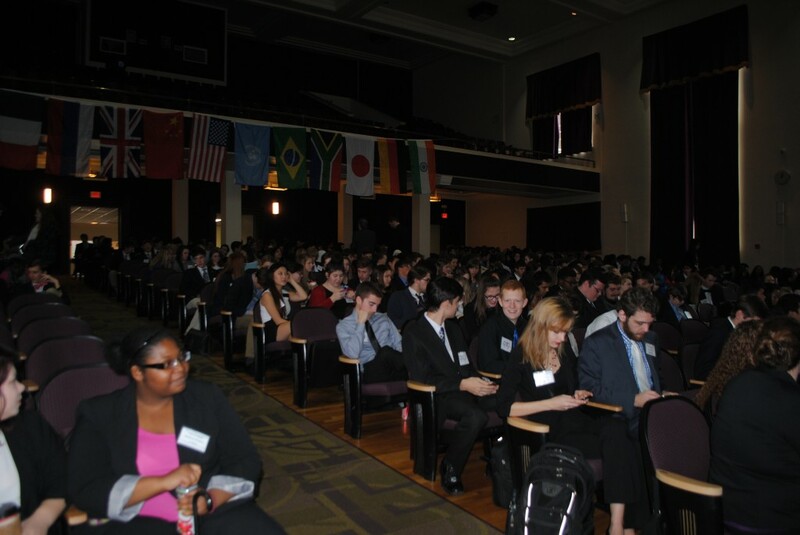 The UCA Department of Political Science sponsored the 48th Arkansas Model United Nations (AMUN) conference at the University of Central Arkansas on November 22-23, 2013. Some 410 delegates representing 72 countries from 24 high schools in Arkansas, Tennessee, and Oklahoma participated in the conference. Logan Spurlock, International Studies major in the UCA Department of Political Science, served as AMUN Secretary-General. 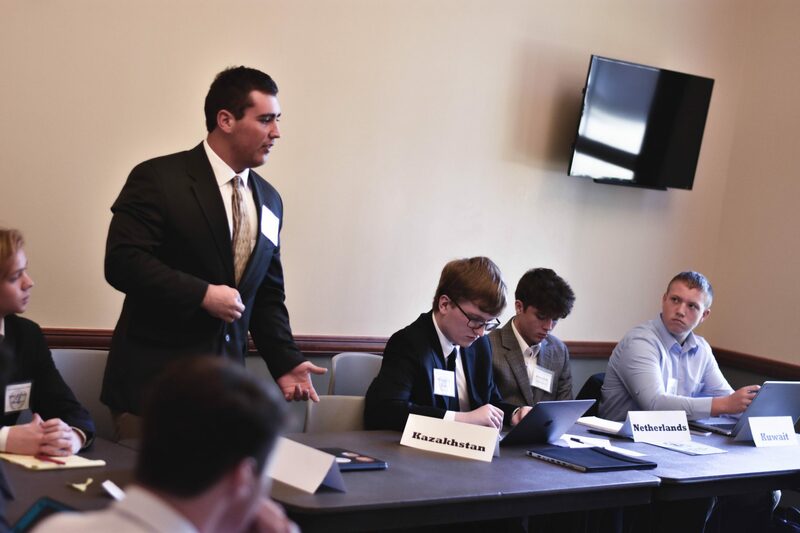 Dr. Mark Mullenbach, Associate Professor of Political Science, served as Coordinator of the AMUN conference. UCA President Tom Courtway gave the welcoming address to the delegates during the Opening Session in Ida Waldran Auditorium on Friday, November 22nd. Brett Newcomb gave the keynote address during the Opening Session. Brett Newcomb served as President of the General Assembly during the first AMUN conference held in 1967, and he served as AMUN Secretary-General for the second and third AMUN conferences held in 1968. Committee chairs included Willis Arnold (Special Political Committee), Juan Mayen (Social & Humanitarian Committee), Miguel Lopez (Economic & Finance Committee), Alic Brown (Legal Committee), Stephanie Gray (Security Council), Breanna Wilbanks (Economic & Social Council), and Kate Loyd (Human Rights Council). 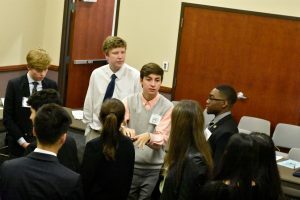 During the Closing Session, the “Outstanding Delegation” award was presented to the Argentinian delegation (Conway High School), and the “Outstanding Delegation Runner-Up” award was presented to the United States delegation (Pulaski Academy). The UCA Department of Political Science sponsored the 47th Arkansas Model United Nations (AMUN) conference at the University of Central Arkansas on November 16-17, 2012. 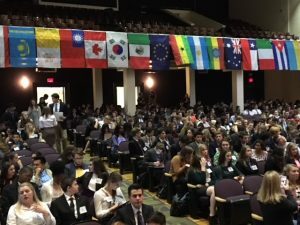 Some 435 delegates representing 79 countries from 27 high schools in Arkansas, Tennessee, Mississippi, Oklahoma, and Florida participated in the conference. Jake Logan, International Studies major in the UCA Department of Political Science, served as AMUN Secretary-General. Dr. Mark Mullenbach, Associate Professor of Political Science, served as Coordinator of the AMUN conference. UCA President Tom Courtway gave the welcoming address to the delegates during the Opening Session in Ida Waldran Auditorium on Friday, November 16th. Hristijan Gjorgievski gave the keynote address during the Opening Session. Hristijan Gjorgievski previously served as AMUN Secretary-General in 2005 and graduated with a bachelor’s degree in Political Science and French from UCA in 2006. He graduated with a Master’s degree in International Relations from the School of Advanced International Studies at Johns Hopkins University in 2009. Starting in 2009, Hristijan Gjorgievski has worked for the Washington DC-based National Democratic Institute (NDI) in Macedonia and Pakistan. As a program manager, he develops and manages democratization projects for NDI. Committee chairs included Logan Spurlock (Special Political Committee), Willis Arnold (Social & Humanitarian Committee), Tyler Bittle (Economic & Finance Committee), Jeffery Montgomery (Legal Committee), Stephanie Gray (Security Council), Juan Mayen (Economic & Social Council), and Kate Loyd (Human Rights Council). During the Closing Session, the “Outstanding Delegation” award was presented to the Iranian delegation (Pope John Paul II High School, Hendersonville, TN), and the “Outstanding Delegation Runner-Up” award was presented to the Belgian delegation (DeSoto Central High School, Southaven, MS). The UCA Department of Political Science sponsored the 46th Arkansas Model United Nations (AMUN) conference at the University of Central Arkansas on November 18-19, 2011. Thomas Willis Arnold, International Studies major in the UCA Department of Political Science, served as AMUN Secretary-General and Dr. Mark Mullenbach, Associate Professor of Political Science, served as Coordinator of the AMUN conference. During the Opening Session, Dr. Clea Bunche of the Department of History at the University of Arkansas-Little Rock gave the keynote address. Ali Rajab, who graduated with a bachelor’s degree in International Studies from the UCA Department of Political Science in May 2010, also spoke during the Opening Session. Committee chairs included Tyler Bittle (Special Political Committee), Thomas Kibwana (Social & Humanitarian Committee), Jake Logan (Economic & Finance Committee), Jeffery Montgomery (Legal Committee), Sam Tamo (Security Council), Naruhiko Tsukuda (Economic & Social Council), and Megan Parrish (Human Rights Council). During the Closing Session, the “Outstanding Delegation” award was presented to the United Kingdom delegation (Pope John Paul II High School, Hendersonville, TN).